One of the most famous French desserts, this French apple pie recipe (tarte aux pommes) is one of the easiest French dessert recipes to prepare. In France an apple pie is a one crust pie or tart. You can serve it anytime or add it to your Christmas dessert recipes. Plus it looks beautiful on a buffet table. - Partially cooked pastry shell for a one crust pie in a 10 ½ inch (26 ½ cm) tart pan using our ea﻿sy pie crust recipe. 2. Peel and cut 4 apples into chunks. 3. Place apple chunks and water in a saucepan. Cook covered over medium heat for about 20 minutes and stirring well. When the apples begin to soften, uncover and add 1 tsp or 1 ½ tsp vanilla sugar and 3 TB butter, letting the compote cook down. Add a little more water if necessary. 4. 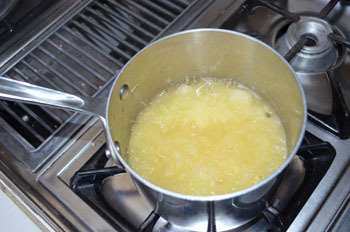 While the sauce cooks, peel and cut 2 or 3 apples into quarters, then cut the quarters into thin strips. Set aside. (they will be used to be placed on top of the pie). 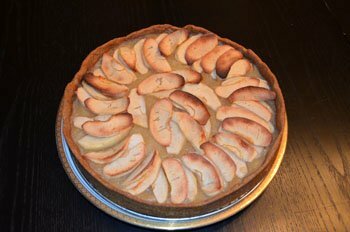 I used 2 apples in the tart above. I think next time I'll use 3 to give it more volume on top. 5. When the sauce is ready, set aside to cool. The sauce is ready when the apples are soft and thick so that you can hold in a mass in the spoon. 6. 10 ½ inch partially cooked tart shell. (easy pie crust recipe). 6. Pour the sauce over the dough and spread evenly. Place the apple slices on top to form a circle. 7. Bake in the middle of a preheated oven for 30 minutes or until the apple slices have browned. 8. When ready, cool on a wire rack lifting away the sides of the pan. Can be served warm or cold by itself or with whipped cream or heavy cream. This healthy French apple tart is low in fat and low in added sugar. You can even leave out the sugar altogether like I do and enjoy a delicious sweet dessert. 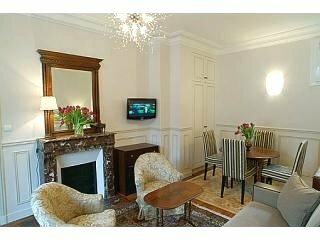 Serving traditional French food at home is a rewarding and fun way to enjoy the culture of France without being there.